This concert was a two part one off, as both of its marvellous Cajun bands were in fine fiddle. Fiddles are, of course, pivotal to the richly textured sound of Cajun music, as are accordions. But you haven’t really heard what either instrument can really do until you’ve listened to a full on Cajun band playing live. If you’re lucky enough to experience that phenomena and you don’t feel like dancing, you really need to get your mojo working! 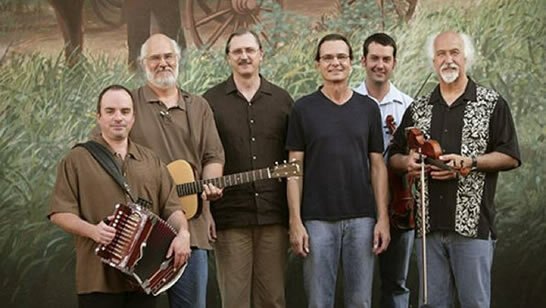 Canjun music, together with its close, Cajun influenced relation, Zyedeco, has its origins in ballads performed by the French-speaking Acadians of Canada. One thus detects strong Celtic strains (also carried to the Appalachian Mountains) in this fiddle spiced music, as well and the more cornucopian approach Beausoleil takes to this glorious musical art-form heightens the experience of listening to it ten-fold, without lessening its historical impetus. The very excellent Sarah Savoy and the Francadians opened this show to a nearly empty house. Big bass man in a cowboy hat, long haired accordion player, fiddler in a straw fedora and Sarah herself, a tall, very expressive singer with a cluster of white flowers in her pinned back dark hair. Large crowd or no, the music they made was atmospheric bayou Cajun par excellence! At a pause in the action, Louisiana born and bred Savoy told the audience her parents had ‘played with Michael Doucet of Beausoleil before she was born.’ Her dad's also been making accordians for 50 years. One of the songs her parents played, ‘Reno Waltz’, a lovely 2 step Cajun waltz was played by Sarah and company in their own catchy way, with some very artful fiddling. Another highlight, sung in Cajun French (as most songs were) was ‘I’m Gonna Quit My Rowdy Ways.’ Sarah is great on blues too. Accordion lent railroad sounds on bluesy numbers and all the other instruments joined in, lending texture. You won’t be able to sit still when you hear this band, so don’t even try – get up and live a little! Michael Doucet and Beausoleil started their US touring career opening for bands like the Grateful Dead. That doesn’t surprise me as I first saw fellow New Orleans legend Dr. John (the ‘Night Tripper’ as he was then known) live, as the opening act on a three group bill headed by ‘70’s British rock band Ten Years After. Beausoleil have never looked back from those days except to come to the assistance of those Cajun artists who’d previously opened doors for them, in order to bring these neglected stars out of the shadows and back into the limelight, where they rightfully belong. That’s a service for which we can all truly be grateful, in addition to their own wonderfully atmospheric, warmly enlivening, incomparable music. For those of us who’ve experienced New Orleans first hand, their music summons up images of smiling folks, dancing, Preservation Hall, Jackson Square, brass bands on Sundays, swamps, gators, hanging moss, wrought iron and balmy see you laters and, of course, seemingly endless world class music, much of it played impromptu, on the streets. During a brief pause for reshuffling of instruments, Michael Doucet made reference to the BP oil ‘spill’ which we all realise by now, is actually, a disaster, saying in a resigned tone, ‘I wasn’t going to mention the oil spill...but it’s another thing Louisiana has to endure,’ quickly adding, before the high they’d built could drop, ‘but the music goes on, doesn’t it?’ The hard times Louisianans have endured in recent years, due to shamelessly callous government neglect in the aftermath of Hurricane Katrina and now via this latest disaster down to senseless corporate negligence, must make their music more of a beacon of hope than ever. No matter what instrument the diverse musicians of Beausoleil are playing, they’re always playing their hearts out. As a band, they’re so finely tuned and rockin’ that you just want to jump for joy when you hear them, though a lively Cajun two step might be more appropriate. I got my first taste of them at a New Orleans Festival at the 02 a couple of years ago, featuring many bands doing brief sets, and I hoped to see them again one day, performing full out. Thanks to Richard Thompson’s Meltdown, my wish came true and I’m now a fan. No matter what Beausoleil play, it is always, full of the joy of living, even in difficult times. This year, Beausoleil, collectively, Michael Doucet on fiddle and vocals, brother David Doucet on guitar and vocals, Jimmy Breaux on accordion, Billy Ware on percussion and Mitchell Reed on bass and fiddle celebrate their 35th Anniversary, which they’ll mark with an extensive tour next year. But there are many reasons why we should celebrate Beausoleil. 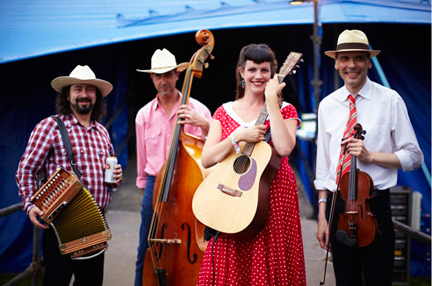 Their music is quintessentially Cajun at the same time as it is distinctively their own, as they like to blend elements of any type of music they enjoy into their gumbo, be it Creole, Calypso, Blues, Rock n’ Roll or anything else they’ve a mind to. They’ve been awarded Grammies twice for their efforts, in 1998 for L'Amour Ou La Folie (Best Traditional Folk Album) and again in 2009, that time for ‘Best Zydeco or Cajun album’ for Live at the New Orleans Jazz & Heritage Festival. They’ve been nominated for a Grammy again this year for Alligator Purse, bringing the nomination total to eleven, and countless other honours abound.